Unlike most Iranian films, which for practical reasons have focused on the circumstances of a few individual characters, Mohammad Rasoulof’s films, such as Iron Island (Jazireh Ahani, 2005) and Head Wind (Baad-e-Daboor, 2008), have often cast their gaze on the entire society. This is a dangerous cinematic enterprise, given the sociopolitical climate in today’s Iran, and Rasoulof has suffered severe consequences for exercising his right to artistic expression. In December 2010 he, along with fellow Iranian film artist Jafar Panahi, was sentenced by the Iranian government on charges of “propagandizing against the regime” to 6-year prison term and a 20-year ban from making movies, giving interviews, or leaving the country . 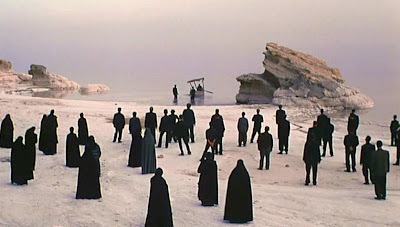 In addition to Rasoulof’s support of the ill-fated Green Movement during the controversial 2009 Iranian presidential “election”, it is possible that the film he released that same year, The White Meadows (Keshtzar Haye Sepid), may have particularly angered the Iranian authorities. Like his earlier film Iron Island, The White Meadows depicts in symbolic form a microcosmic society operating according to oppressive rules. But while the oppression in Iron Island could be dismissed as arising from the depravities of a single agent, i.e. the captain, the oppression depicted in The White Meadows is indicative of a pervasive social disorder. There is something endemically wrong with the entire social belief system as it is presented in The White Meadows. Of course everything in the film is cast in allegory, and the film does not make overt critical references to the current Iranian system. Thus it could be viewed as a general philosophical lament against man’s susceptibility to rely on superstition to account for the dangerous world around him. But most viewers of the film will narrow their focus and look for analogies in an Iranian context. Certainly the most striking feature of the film is its open-ended mythic imagery. The succession of fantastic scenes offer no clear-cut answers as to what is going on, and the film’s ultimate obscurity counts as its poetic strength (but also as a narrative weakness). The evocative imagery will persist in the viewer's memory, and it has all been masterfully crafted by veteran cinematographer Ebrahim Ghafouri. But this film’s narrative obscurity and consequential ambiguity leave a cloud of uncertainty over everyting. In this connection I will discuss five specific questions I have about the story later on. The story of The White Meadows is set in the desolate landscape of Lake Urmia in western Iran, which is a huge salt lake that is essentially an inland sea. The area is subject to droughts, and exploitation of agricultural water from the lake’s basin that has raised salinity levels to the point where aquatic life has been severely diminished. The poor native people in the area pray for rain that never comes, and they fall back on superstitious beliefs in hopes of appeasing local spirits that have presumably cursed the region with drought. 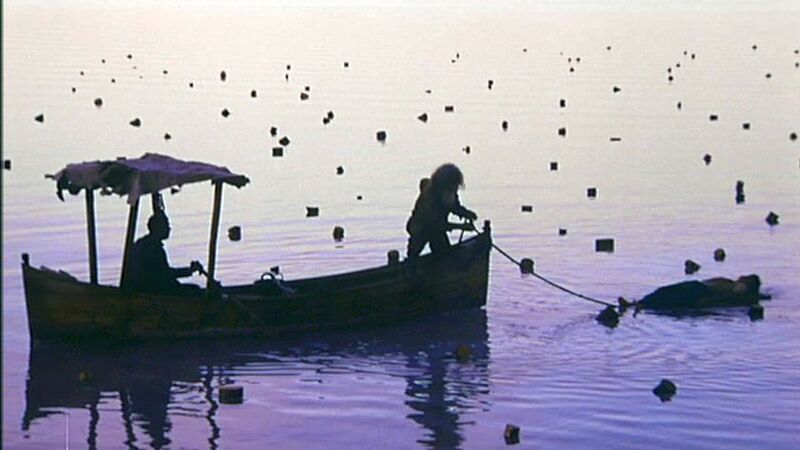 At the beginning of the film, we see a lone figure, Rahmat, rowing to one of the sea’s islands in his dinghy. His mysterious occupation, we soon learn, is to collect the tears from the local people and take them for some unknown future purpose. 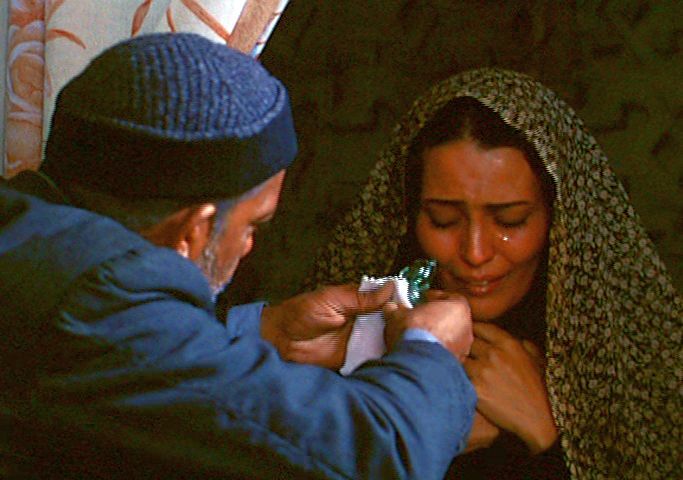 These tears are believed to have some magical import, and some of the people believe that Rahmat can turn them into pearls. 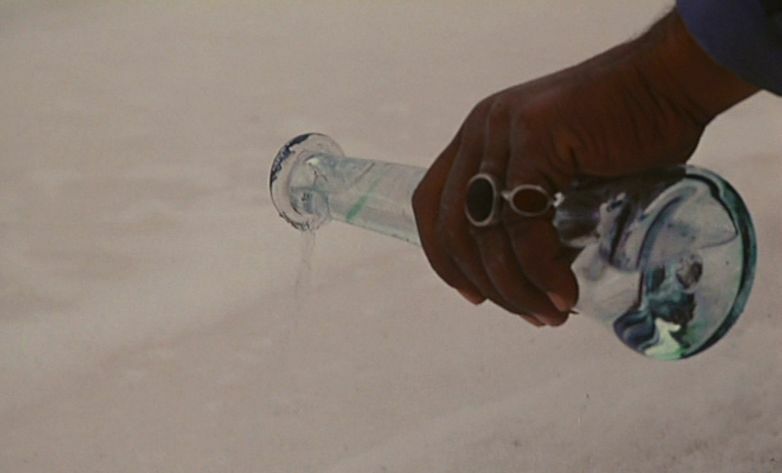 For the rest of the film the focalization is entirely on Rahmat as he travels to five desolate, salt-covered islands collecting tears. Each visit has a separate symbolic story to it, with unexplained elements that add to the mystery. Rahmat’s first visit is to retrieve the dead body of a beautiful young woman. A senior figure of the island tells Rahmat that the woman was too beautiful – other women were jealous of her, and the men were “humiliated” by her beauty. This is certainly a problem in many parts of the world where men feel weakened by their attraction to women. Their solution is to blame and punish the source of the attraction, and one suspects that this particular woman was murdered for this reason. For preservation, the woman’s body is kept covered in salt, and we only see her foot in a red sandal (more about the red sandal later). Here, as in all the other island visits, Rahmat carefully collects into his little glass pitcher the tears that flow down the villagers’ cheeks as they reflect on their sorrows. When Rahmat sets out to sea in his dinghy with the covered body onboard, he discovers that a teenage boy (the “Boy”, for our future reference) has disguised himself as the dead woman’s body (and is wearing the same red sandals) in an effort to escape the island. Rahmat first throws the stowaway into the water, but eventually agrees to take him along with him, as long as the Boy pretends to be a deaf mute in front of other people. When they arrive at the second island, they see a blind man who has discovered a red sandal washed up at the shore. He takes it to a village elder women, who seems to place some importance on the sandal. Rahmat and the Boy then learn that the people are collecting their sorrowful prayers by whispering them into jars and then sealing them. They believe that a jinn, a local deity, fled to the bottom of a well some three hundred years ago and cursed the region. A pitiable dwarf from the village is conscripted to carry all the prayer jars and be lowered down by a rope to the bottom of the well in order to offer them to the jinn and beseech her to return. But he must accomplish his mission before the sun rises, or all the prayers will be voided. In the event, he fearfully descends down the well, but when he doesn’t reappear before the first rays of the morning sun, the villagers cut his rope, and we hear the dwarf splash to his death down in the well. At the next island, Rahmat and the Boy discover that the most beautiful young girl of the village is to be sacrificed to the sea god in hopes of ending the drought. They prepare her for a “wedding” to the sea god, and they all swear oaths to the sea that the reluctant victim is a virgin and only loves the sea. When the terrified girl in her bridal gown is taken out on a raft and set adrift in the sea, we learn indirectly that the Boy tried unsuccessfully to rescue her. For his selfless troubles, the Boy is sentenced to be stoned. But during the stoning when the presumably mute Boy is heard to cry out in pain, Rahmat intervenes and fools the villagers into believing that God has forgiven him. However, the Boy is gravely wounded and barely conscious when they leave for the next island. 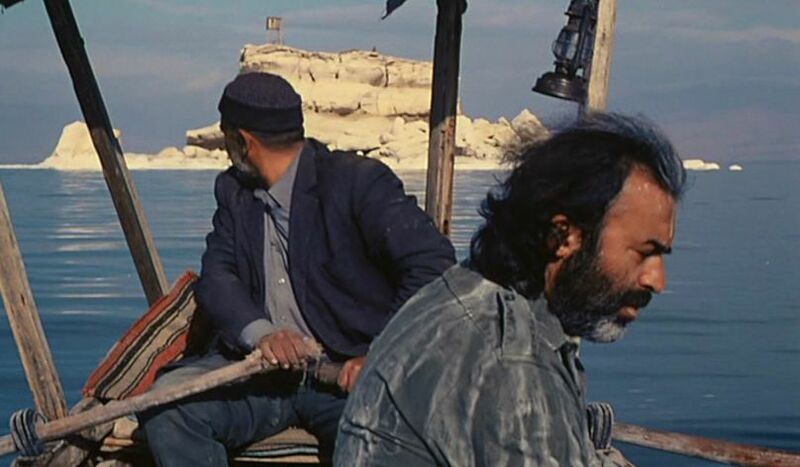 With the injured Boy left on the dinghy, Rahmat is taken to observe a painter on the fourth island who is being punished for painting the sea in the color red instead of blue. The village elder orders him that unless he paints it blue, he will continue to be tortured (one example is to pour monkey’s urine into the painter’s eyes). The painter says he cannot paint in colors other than what he says. Eventually, the painter is given into the custody of Rahmat and ordered off the island. Rahmat, the Boy, and the painter arrive at the next island, which is inhabited by a wizened bearded man who appears to be half mad. It turns out that he is operating a prison, and he is to take the Boy and the painter ashore as prisoners. The Boy soon dies from his wounds, and his body is “buried” in a little lagoon, where it appears that many previous prisoners have been so disposed. As Rahmat leaves this island, the mad prison warden is seen to be nonsensically ordering the painter to repeatedly climb up and down a sand dune and shout out the sea’s true color. Rahmat now comes ashore to the mainland, which, unlike the desolate salt-covered islands, is a green space in autumnal splendor. 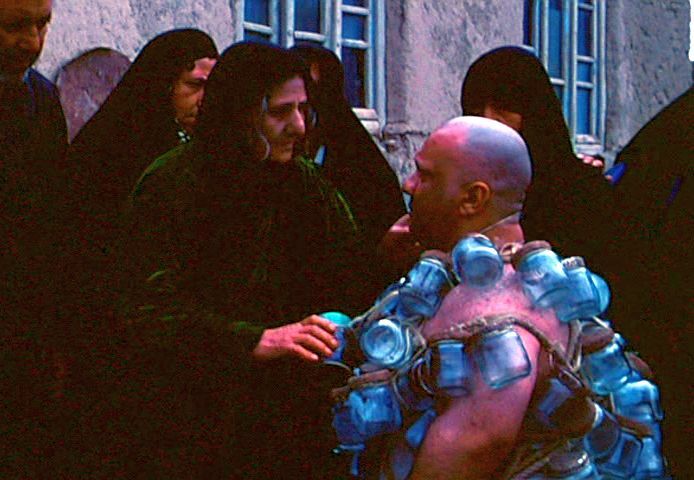 He stops at a villa, where a women wearing the same type of red sandals seen earlier brings him some water. Then another woman brings out an old man in a wheelchair, and Rahmat uses his pitcher full of tears to wash the man’s feet. Afterwards, Rahmat collects the tear-water in a bowl, pours it back into his pitcher, and then goes out to the seashore to empty its contents. What you might take away from all this material will depend on your own perspective. The film could be seen as a generally pessimistic view of man’s continual surrender to simple superstitious beliefs. But there is a special emphasis here on shared guilt. On all the islands, the people feel they are guilty and seek remission of their sins via some superstitious ritual, often at the expense of the weak and defenseless. Innocent women are punished on the first and third islands, the innocent dwarf is sacrificed on the second island, and free artistic expression is denied on the fourth island. The people on these islands who carry out the atrocities are basically innocent, too, since they sincerely believe in the superstitions that drive them to cruel acts. There is clearly something wrong with the system governing these local societies (as was the case in Iron Island, too), but any references to the Iranian government system seem to be obscure, at best. The idea of the jinn hiding in the well for three hundred years may compare with some accounts of the Islamic Shiite belief that the long-awaited Mahdi was hidden in a well. In addition, some viewers have suggested that the washing of the old man’s feet at the end of the film connotes extreme and pointless obeisance to an ayatollah who is unmindful of the common needs. But apart from these general issues, I have five questions about the story that remain unanswered for me. The Boy’s father. The Boy had been hoping to find his long lost father, who apparently had become crazed by the region's salt-encrusted environment and had deserted his home when the Boy was an infant. There is some possibility that the prison warden encountered on the fifth island is actually the Boy’s lost father and that the long absence prevents him from recognizing his son. But if this is true, nothing is made of this connection. The two girls. The girl seen wheeling the old man in the wheelchair at the end of the film looks very similar to the girl who was sacrificed to the sea god on the third island. When Rahmat encounters both girls, he seems to exchange meaningful glances with them. Is there a connection? What is the importance of the girl in that final scene? The red-colored sea. The artist on the fourth island is punished for painting the sea in a red color. 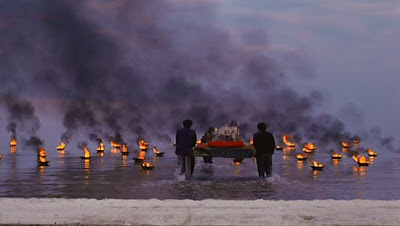 At the end of the film when Rahmat comes to the villa, there is a painting on an interior wall that appears to be an island surrounded by a red-colored sea. Is this merely to show the contrast between what the elite allow for themselves and the narrowly defined behaviour they force on the masses, or is there something more to this? I have heard some people suggest that red is a disfavored color in Islamic societies, but I am unaware of red being formally sanctioned. 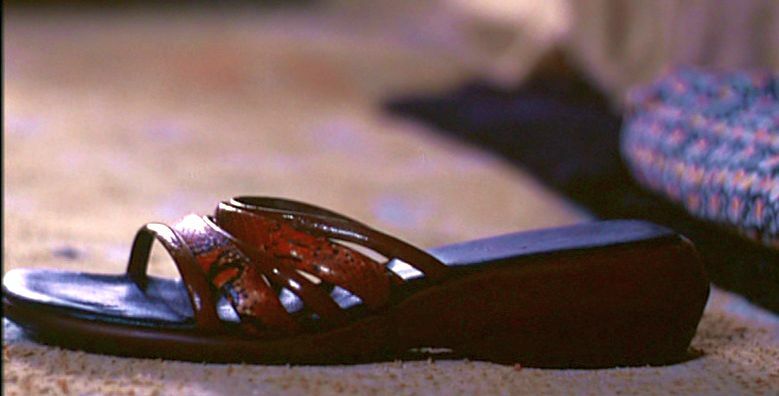 The same type of red sandals appear at several points in the story, and they are sometimes given suggestively meaningful closeups. Could a red sandal worn by the Boy have slipped off when he was cast out of the boat and been washed ashore to be discovered by the blind man? What is the connection between these various scenes and what is their importance? Rahmat’s complicity. Rahmat seems to be aware of the absurdity of some of his rituals. He also sometimes engages in compassionate acts, such as when he rescues the Boy or when he covertly urges the painter to say “blue” irrespective of what he sees. But at other times, he seems to be a willing conspirator in an oppressive and pernicious system of community practice. He is enigmatic, but is he really a consistent character that we can believe in? To a certain extent he could be considered to be simply a dutiful functionary in a semi-dysfunctional system who is merely trying to do his best. How are we to judge such willing participants in iniquity? At one point he tells the Boy that the tears are valuable and not a single drop should be wasted: “tears should be treated with respect”. 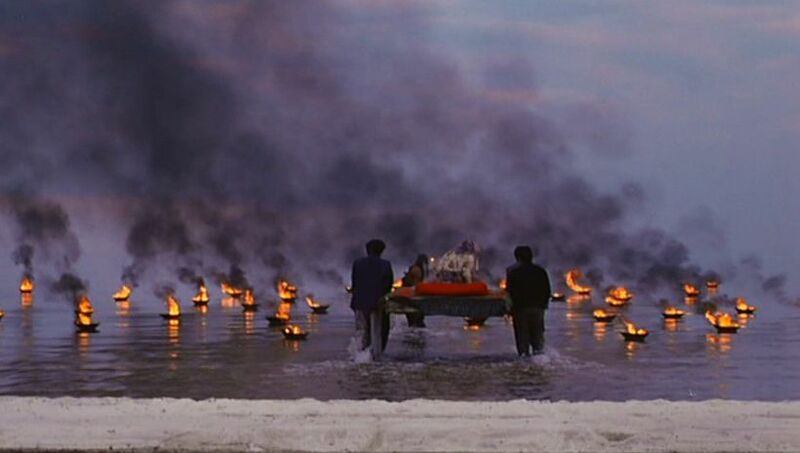 And yet at the end of the film, he is seen disposing the “used” tear drops into the sea. Rahmat does not intend to harm, but Rasoulof’s critical eye may be ultimately directed at his character. Skeptics might argue that Rasoulof has merely mindlessly thrown together these provocative symbols in the fashion of Alejandro Jodorowski. But there is enough subtlety of expression here to suggest otherwise and that there is some method to the madness. Overall, I would say that the visual presentation of The White Meadows is haunting and even gripping at times. The viewer is plunged into an austere and evolving nightmare. But the individual episodes do not appear to represent any narrative progression – they could have come in any order. And at the end of the film, the final images do not provide a dramatic denouement, but are merely deflating. Nevertheless, the film is memorable, and Rasoulof’s eery and disturbing portrayal of how blind superstition can be ultimately cruel and destructive is a testament to his own commitment to free expression. “Mohammad Rasoulof”, Wikipedia (2013), http://en.wikipedia.org/wiki/Mohammad_Rasoulof, (accessed June 2, 2013).